CPC sales units are estimated in about 2 millions. machine by two generations of computing fans that remember it. 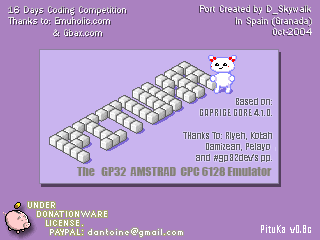 PituKa is an Amstrad CPC6128 emulator for the Gamepark GP32 handheld system. - Image CPC disk Support (DSK). - Multichannel Sound and real time channel mix. - Three Pad modes configuration. - Save configurations of Vkeyboard and general options. - COPY PituKa_XX.fxe to GP:\GPMM. - Create new directory for your ROMS, GP:\GPMM\AMSTRAD\ and copy your DSK files to the new directory. - To insert a disc image. press [START] and choose INSERT DISK in the main menu. extension, Ex: ABADIA.BAS, GRYZOR.BIN, TETRIS. bottom. There is a tip to do this faster, look at the bottom. You can get the ["] symbol pressing the buttons [L] and the  vkey. [|][C][P][M] and the Press [SELECT]. You can get the [|] symbol pressing the buttons [L] and then vkey to the RIGHT of [P].